Wholesale Trader of a wide range of products which include gemological swivel binocular microscope. Gemological Swivel Binocular Microscope is used to distinguish between genuine and imitation gems, to inspect surface inclusions, to judge production of origin and to inspect polishing. It is also used to exhibit explain to the customers at jewellery shop. The Microscope is provided with transmitted and flourescent incident light system. 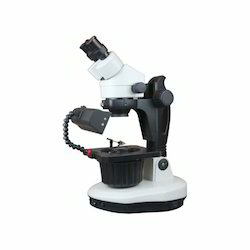 These Microscope have earned the reputation for having excellent optics, rugged dependability, versatility economy. The Microscope share a unique substage brightfield and darkfield illuminator, an adjustable epi-illuminator and a gem clamp for unsurpassed versatility in a wide range of scientific and industrial applications. In industry, the combination of incident and transmitted illumination afforded by these microscopes quickly locates both surface and hidden defects; profile examination under darkfield illumination quickly shows up flaws, burrs and surface inclusions, brightly illuminated against a dark background. In geology, mineralogy and gemology, it clarifies the structure of crystals and aids in their positive identification. It is also invaluable for certain biological applications, such as examination of large embryological specimens, planktons, fungi or colonies, requiring the stereo microscope's great depth of field. The Model RGM-Series offer superior quality optics and reliable mechanical components. This exceptional optical quality allows users to perform tasks efficiently and maintain high productivity. A wide variety of stands and illuminators are available to suit various applications. These microscopes feature a zoom magnification from 7x to 45x, zoom ratio 6.4:1, with standard Eyepieces WF 10x/20. The images are sharp, clear, flat and have good resolution contrast even at periphery of field. Binocular Body inclined at 45°, for fatigue free viewing, can be rotated a full 360° and locked in any position. Ergonomically positioned bilateral ocular tubes are interlocked for improved operation. Looking for Gemological Swivel Binocular Microscope ?